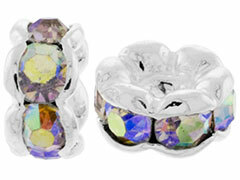 Beveled rondelles have curved barrels to showcase the beautiful faceted crystals embedded within them. These sparkling 6mm Crystal AB curved rondelles will bring an added dimension of elegance to your designs when used as spacers between crystals or pearls in earrings, bracelets and necklaces. INM Crystal is pleased to offer these stunning silver and gold plated beveled crystal rondelles in a variety of sizes and crystal colors. For inspiration on using these glittering curved rondelles in your original designs, please visit INM Crystal’s Idea Gallery. These items are not made by Swarovski. This product was added to our catalog on Tuesday June 13, 2006. Well made item I've been using these more frequently because ..